I see people talking about separation anxiety a LOT. Way more than I should. I say that because the majority of people who ask me about separation anxiety in their dogs, have dogs who do NOT have separation anxiety! Here’s the super quick rundown. Separation anxiety is a very specific disorder, yes, a DISORDER. It has very specific symptoms that must be present to be diagnosed. Some of the symptoms occur alone, others in the presence of other symptoms. I begin by saying that because a disturbing number of people commonly throw this term around with no knowledge or experience on the actual condition. They jump to the conclusion that there must be something wrong with their dog because it does something unpleasant, which is not the case. Just because your dog chewed something when you left does not mean it has separation anxiety. Just because your dog follows you around does not mean it has separation anxiety. Just because your dog barks or whines in the crate does not mean it has separation anxiety. Just because your dog uses the bathroom in the house does not mean it has separation anxiety. While these are usually present in dogs with separation anxiety, there are a number of other factors that must be considered before such a diagnosis can be made. We must look at environment, age, background and history, as well as when the behaviors are occurring and also at what severity. Excessive salivation, dilated pupils, and self destructive tendencies are also huge factors. Before you can even think to look at the aforementioned behaviors as symptoms of separation anxiety there is something incredibly important you must reflect on first. The very same behaviors that can be present during separation anxiety are also very common among dogs without the condition. Dogs who are not being fulfilled by their owners will seek to stimulate themselves. Most of the time their choices are not what we would find to be “appropriate”. What does being fulfilled even mean? Dogs are active animals. Many breeds were created through years of selective breeding to perform complex and demanding tasks and jobs. One job that most dogs were not created for was being a couch pillow or your cuddle partner. While they might be great cuddlers, the reality is THEY need more in their lives to truly thrive. It breaks my heart to see dogs that I am called to “fix”, simply behaving the way any dog would when not having its needs appropriately addressed. I then spend my time educating the human, not fixing the dog. The dog isn’t broken. The mental and physical stimulation requirements of most dogs people have “issues” with are simply not being met. I learned early on in my career in public education that the old adage “idle hands are the devil’s playground” is pretty much always true. We know that we need to keep our children busy with productive activities that keep them out of trouble. When not occupied appropriately, and left unsupervised with zero potential for consequences, there’s a good chance a kid might not pick the most appropriate activity to occupy themselves! It’s even more essential with our dogs that we address this unquestionable reality. Dogs need daily activity that is structured and planned with the goal being to drain their mental and physical energy tanks. Failing to do this will result in undesirable consequences. That does not mean the dog has separation anxiety, it means the human hasn’t done their part. In my article on dealing with a destructive dog (read HERE) I explain how destruction is always the human’s fault, not the dog’s. Want to find out if your dog has separation anxiety or simply needs more from you? Please describe your dog’s daily routine. 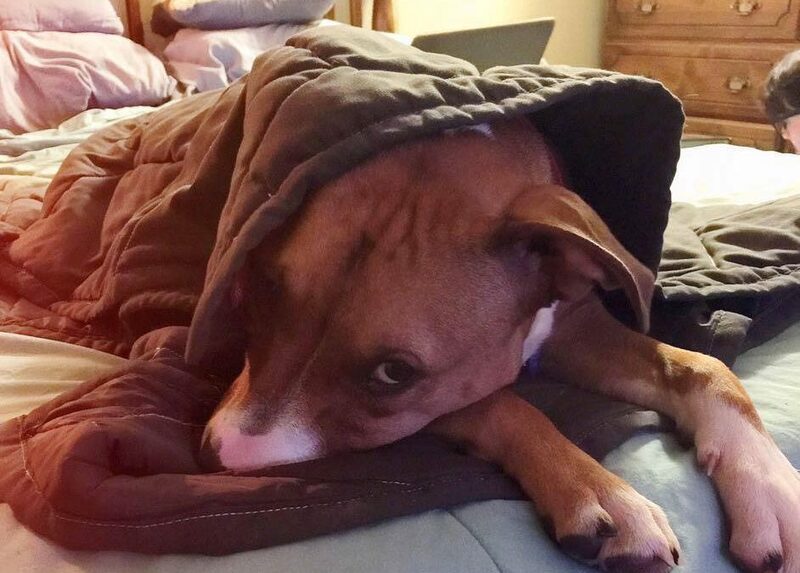 What does a typical day in the life of your dog look like? The answer to this question will provide me with what I need to know rather quickly. For dogs chewing things up or getting themselves into trouble, most often their owners explain their day in terms of time spent being “let outside” or if there are other dogs “playing with their fur-brother/sister’. They don’t mention anything about training, or if they do mention walks, it is quickly determined it’s not the “right” kind of walk. I find that people with fenced in yards fall into a false sense of security by thinking “letting the dog out” is all they need to do. They are wrong. Dogs need what I explain as Routinely Structured Stimulation. This means that every day, the dog can expect to participate in activities WITH the owner that not only keep the dog physically active, but are mentally stimulating. To simply go for a walk isn’t enough, especially if a walk means throwing on a harness and letting the dog drag you all over while it barks and jumps at everything out on your walk. Opening up the back door to the yard allowing the dog to “run around” isn’t going to cut it either. We need to plan and structure the activities in a way that will engage the dog to think and work things out. Each and every day the dog should be taken on a long structured walk. A structured walk means the dog must focus on you and not simply drag you around the neighborhood going where it pleases. At least one INTENSE exercise session should be provided. Walks don’t count as exercise! You need to be playing an intense game of fetch, doing some flirtpole with the dog, letting them work on a springpole, or if you have one designed for dogs ( I don’t support the practice of putting dogs on human treadmills), getting them on a treadmill to drain some energy. The last thing that needs to happen DAILY is training. A minimum of 3-5 brief sessions where you work on your communication with the dog teaching them desired behaviors is essential. 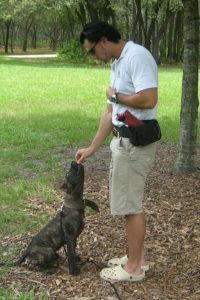 Get started with some clicker training by clicking HERE and reading an article that will get you started on a super fun and stimulating journey for you and your dog. Mental and physical fulfillment is a necessity for your dog to thrive and are far more valuable than cuddling on the couch. Also worth mentioning here at this moment is the consistently to which all the previous information must be applied. Dogs find exponentially more comfort in routine and predictability than they do kisses from their owner. You must put together a plan for your dog based on your schedule. If you don’t have the time to do this, then ask yourself why you got a dog in the first place. So, if you aren’t providing the amount of stimulation explained in the previous section, you shouldn’t even be talking about separation anxiety or even worse, asking what kind of drugs the dog should be given. The reality is that until you meet the dog’s minimum needs for mental and physical stimulation, you really don’t know the severity of the situation. For some folks, they can do all the above and then some, and the dog is still turning into a salivating, screaming, self destructive mess the moment they step out the door. They know this because the neighbors are calling them at work asking who is skinning the dog alive at home based on the screaming, barking, and banging going on. That is what separation anxiety often looks like, it’s a nightmare to deal with. For the people who genuinely struggle with dogs suffering from this very specific condition, they don’t appreciate hearing others throw the term around to describe a dog who simply isnt getting enough proper interaction and species appropriate stimulation from their owner. If you are still convinced your dog has separation anxiety there are absolutely ways to address it before pharmaceuticals (which far too many people are too quick to resort to). Consult a local behaviorist in your area for a PROPER diagnosis and then work with them to put together a behavioral plan to help address the issue.